Onward, as Robert Creeley would say. Let’s move to Kulchur 4. What strikes me about this issue is Burroughs and Kerouac’s picture on the cover. Gilbert Sorrentino guest-edited this issue. In his essay in The Little Magazine in America collection, Sorrentino writes, “Marian Zazeela, Marc Schleifer’s wife, gave me a snapshot of Kerouac and Burroughs taken in Paris about 1955, and that became the cover; the title page identifies it as a photograph of Inspector Maigret and Sam Spade.” Steve Clay and Rodney Phillips quoted a longer version of this passage in A Secret Location on the Lower East Side. So Sorrentino’s statement has been accepted as fact. This has always puzzled me, as a little knowledge of the Beats throws into question the date and the location of the photograph. Neither Burroughs nor Kerouac was in Paris in 1955. I don’t think the two writers met at the Beat Hotel or anywhere else in France. Kerouac traveled to France in 1957 and in the late 1960s (recounted in Satori in Paris). In both cases, Burroughs was not present. Looking at the photograph Burroughs looks like a proper Viennese doctor. As for Kerouac where are the Levis, the lumberjack shirts. What is with the hat? This is not Kerouac in the 1950s. Clearly, this is an early photograph. This picture captures the very beginnings of the Beat Generation in New York in the mid-1940s. In fact, it was taken in 1945 at Columbia University along with another iconic shot. At the Edwin Blair Auction in March 2006, one of these pictures came up for sale. 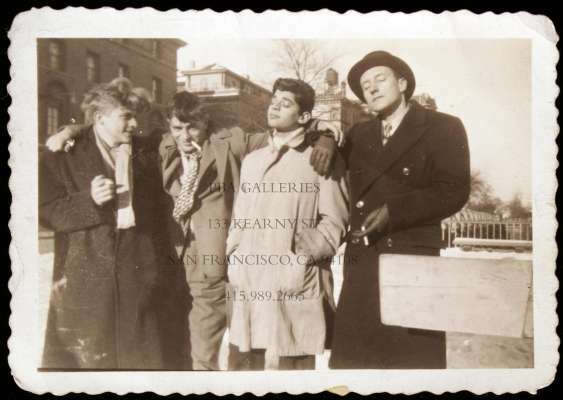 Lot 295, a snapshot of Burroughs, Ginsberg, Kerouac and Hal Chase, was one of the highspots of the sale. The picture graces the cover of the auction catalog. The catalog description reads in part, “Rare, and one of the most important Beat Generation images, if not the most defining image, taken from where it all started, Columbia University.” The image sold for over $7000, one of the top three items of the auction. John Tyell placed the image on the cover of his landmark study Naked Angels. The photo on the cover of Kulchur 4 must have been taken the same day. The background of the two photos is identical. Note the buildings in the upper left corner. 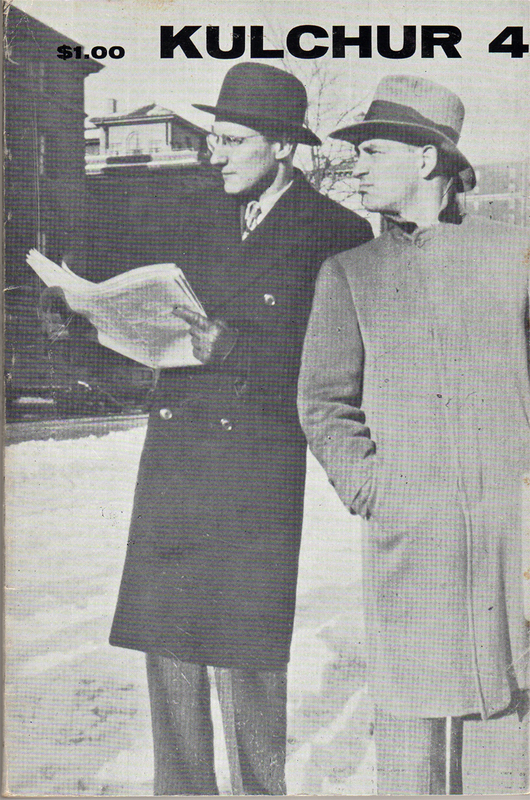 Clearly, Burroughs wears the same overcoat, tie, and gloves. He has glasses in one shot and not in the other, but the dress is the same. This photograph of Kerouac and Burroughs tells an interesting story discussed in Oliver Harris’ The Secret of Fascination. Harris writes of the relationship between Kerouac and Burroughs, and the influence as a writer Kerouac had on Burroughs. The impact of Kerouac writing Burroughs as Will Dennison in The Town and the City is huge. The influence ran both ways. Harris, of course, discusses the fascinating aspect of Burroughs as well. The role of Burroughs as intellectual pied piper is told in great detail by John Lardas in The Bop Apocalypse: The Religious Visions of Kerouac, Ginsberg, and Burroughs. I don’t think there is a fuller examination of the early years of the Beat Generation trio than Lardas’ book. Lardas treats the early Beats as intellectual and religious questors. Time and sober scholarship has proven that this was the case, despite early depictions of them as “know-nothing Bohemians.” In these early years, Burroughs was a major influence on Kerouac and Ginsberg, introducing them to Spengler, linguistics, and French thought. Sammy Sampas and Lucien Carr are the other lightening rods of this time. The photograph in Kulchur 4 highlights the close relationship between Kerouac and Burroughs as well as suggesting the role of Burroughs as teacher and dispenser of knowledge (reading the newspaper). In any case, get a hold of Lardas’ book. It is worthwhile reading. What is the reason for the confusion of Sorrentino? The caption that goes with the photo in Kulchur suggests that the editors were aware of the proper chronology. The reference to Inspector Maigret and Sam Spade comments, not just on Burroughs and Kerouac’s appearance, but also on their literary collaboration undertaken at the time of the photograph. As discussed recently in the Burroughs forum, And The Hippos Were Boiled in Their Tanks is a legendary lost classic of the Beat canon. One of the earliest instances of creative writing from Burroughs and Kerouac, bits and pieces have surfaced over the years. The novel documents the murder of David Kammerer by Lucien Carr that occurred in 1944. The style of the novel mimics the manner of Hammett, Raymond Chandler and other hardboiled detective writers. Possibly, Kerouac and Burroughs were playing on their hardboiled personas in this photograph. The caption suggests the editors of Kulchur possessed an intimate knowledge of the image’s history. Sorrentino’s slip of memory provides some insight into the state of mind of some of the editors of Kulchur and the state of the magazine. The picture of Burroughs and Kerouac highlights the origin or birth of the Beat Generation. By issue 4, Kulchur was experiencing growing pains and concerns about its origins. Marc Schleifer abandoned the revolution of the Word for the revolution in Cuba. While Hornick is on record as stating that Kulchur 4 was more to her taste than the first three issues, she had yet to fully mold the magazine to her vision of the New York art world. Sorrentino is a dominant figure, but Kulchur in this middle period strikes me as a heavy dose of Leroi Jones as he was questioning his past and transforming into a black nationalist. After Kulchur 4, the magazine stabilized to some extent (Jones’ intellectual crises aside). Sorrentino expresses a fondness for the issues of this period onward for the next year or so. The magazine possessed a core of editors and contributors, like Frank O’Hara and Leroi Jones. In my opinion, the early and late issues of Kulchur are the most enjoyable. The presence of the Beats in the early issues and the Second Generation New Yorkers, like Ted Berrigan or Ron Padgett, in the later issues captures my interest most. What is clear is that Kulchur 4 represents a pivot point in the magazine. Kulchur was about to change its editorial leader and its direction. The picture and the confusion regarding its date express an anxiety about origins and a desire to get away from one’s past. In this case, the editors were deeply concerned with Kulchur‘s Beat origins. Hornick aspired for something more refined and self-consciously avant-garde than the rough and tumble Beats. In addition, Jones was experiencing conflicting feelings about his relationship to his Beat past that was essential to his birth as a poet. Possibly providing Sorrentino with this image, Schleifer or his wife slyly reminded the editors of Kulchur to remember where they came from as they stretched out in new directions. As Kulchur 1 and 3 show, Schleifer published, at its heart, a Beat magazine. The cover is a troubled look back on its past. The cover image also signals the fact that the Beats, like a private detective, were about to go largely undercover and out of sight in the pages of Kulchur. The Beats would never disappear completely. They dominated Kulchur‘s origins and haunted its future in the figures of the Beat-influenced Second Generation New York School. Kulchur 4 has always interested me for what is says about the early Beat years, the relationship between Burroughs and Kerouac, and the state of Kulchur magazine and its editors. Written by Jed Birmingham and published by RealityStudio on 15 February 2007. Also see the companion piece William Burroughs in New York City 1964-1965. The Allen Ginsberg website claims that Ginsberg took the photograph of Kerouac, Burroughs, Ginsberg and Chase in Morningside Heights, NYC. Ginsberg was an avid photographer and many of his photos are also shown with details and dates.